The days are sunny and beautiful. The nights are comfortably cool. It’s summer in the west and the mountains are ripe for hiking and camping. Everyone knows that jerky is a great grab-and-go snack for day hikes, but it’s completely underappreciated when it comes to easy camping meals. All of the things that make jerky a great mid-day snack – easy to pack, dehydrated, or smoked like Mountain America Jerky, and won’t spoil – make it even better for easy camping food. Whether you’re hoping in your car for a quick overnighter or trekking through the wilderness on a week-long backpacking trip, check out these easy camping recipes the next time you find yourself looking for camping meal ideas. Easy camping meals don’t have to reinvent the wheel. Do you love the ease of a hot dog but can’t stand the thought of another plain dog on a cold bun? Well, have no fear. We give you the beef jerky dog. Cut the beef jerky into bite-sized portions (a pair of kitchen shears or a pair of scissors usually works best) and place it in a bowl. Boil the water over the campfire or on a camping stove then pour over the beef jerky. Let the jerky soak while you prepare the rest of the ingredients. Next, gut the hot dog buns and set each one in a piece of tin foil big enough to wrap it in completely. Mix the onion, chili and barbecue sauce together in a bowl. Once the beef jerky is nice and soft, drain the water and add it to the mixture. Scoop the mix into the gutted hot dog buns and wrap the buns tightly in tin foil, making sure everything is sealed up tight. Place the “dogs” on coals for about 15 minutes to cook, unwrap and dig in! Whether you’re looking for a hearty breakfast or a satisfying dinner, easy camping meals shouldn’t require you to sacrifice quality for convenience. This simple skillet recipe will have you going back for seconds every time. Want to ramp up your veggie game with this easy camping food feast? Feel free to add mushrooms, spinach or any other vegetable your heart (or stomach) desires. Cut up the jerky and soak in boiled water to soften while preparing the rest of the ingredients. Heat up the oil in the cast iron skillet and add the potatoes. Cook for about 8 minutes, until golden and slightly browned. Drain the jerky and add it to the pan with the garlic, sea salt and asparagus. Cook for about 8 to 10 minutes, or until the asparagus is cooked through and tender. Make a space in the center of the skillet, crack the two eggs into the hole and cook to your liking. Grab a fork and enjoy! Who doesn’t love nachos? When it comes to easy camping recipes, you can never go wrong with chips, cheese, beans and beef jerky. Cut the beef jerky into bite-sized portions and place in a bowl. Boil the water over the campfire or camping stove then pour over the beef jerky. Let soak until tender. Oil the bottom of the Dutch oven to keep nachos from sticking then evenly spread 1/3 of the chips across its bottom. Top the chips with ¼ of the beef jerky, 1/4 of the hot tomato sauce, ¼ can black beans, ¼ cup cheese and a handful of avocado, green onions and cilantro. Repeat until all the ingredients are layered in the Dutch oven. 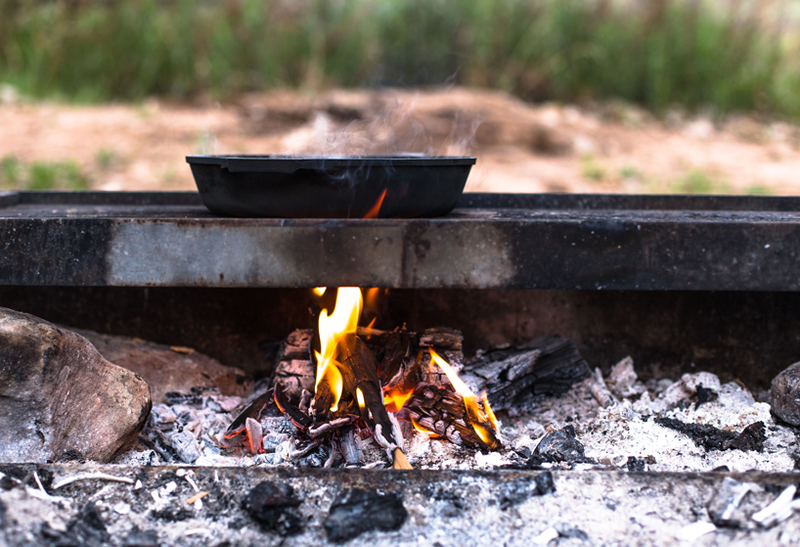 Cover the Dutch oven and place it on the metal grill over your campfire. Bake until the cheese is melted, about 10 minutes. Any way you shake it, when it comes to easy camping meals, you can never go wrong with a little jerky in the mix. So, get out there, enjoy your summer adventures, and don’t forget the jerky!